Just My Dinner: There's a pie in my cupcake! 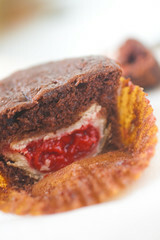 There's a pie in my cupcake! Happy April! I'm a little belated with posting this, given that it's no longer April 1st, but they're fun for a party, and if decorated, I'm sure they'd actually be pretty. My butter just wasn't being nice, and neither was the microwave, so I opted out of frosting these cupcakes. Over the summer, my friend texted me a picture of a chocolate cupcake with white frosting on top and a mini cherry pie in the middle that he saw online. I was intrigued, and told him I was tempted to try to make them. His birthday was a couple of weeks ago, and since it was midterms week, I decided to try to cut down on the weight of my groceries and the amount of time I'd spend on it, even if that meant sacrificing quality, so he could have a cupcake with a tiny pie in the center. They're pretty simple to make, though because of the two steps, a bit more time consuming that just making plain chocolate cupcakes from a box, but only by about 20 minutes or so. Preheat oven to 450ºF. Cut pie dough into 12 2" circles, and press into a mini muffin pan. Fill each with a spoonful of cherry pie dough. Cut out 12 1" circles from remaining pie dough, and top each pie with the dough, pressing edges together. Bake for about 8-10 minutes, or until edges are golden. Remove from oven and let cool until you can remove them from the pan, about 5 minutes. Decrease oven temperature to 350F. Meanwhile, prepare chocolate cake mix as directed. * Line a muffin pan with 12 liners, and scoop a heaping tablespoon of batter into each one. 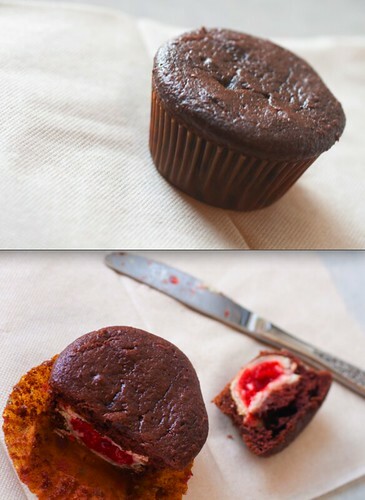 Place a mini pie in each muffin cop, and top with another heaping tablespoon of batter so that they are completely covered. Bake in 350ºF oven for about 15-20 minutes, or until tops are dry and spring back when pressed lightly. Remove from oven. Cool slightly in pan, and then transfer to a wire rack to cool completely. Ice or enjoy as is! • Since it should make enough for 24 cupcakes, you'll have extra batter. Alternately, you can buy/make more pie dough, or make more mini pies, and make that number of the cupcakes as described enough (my guess is around 30 total) or just make extra plain cupcakes with the remaining batter. A package of pie dough should have enough crust for about 14-16 mini pies. My guess is that a small can of cherry pie filling will probably make about 20 or so pies.